Distress Markers/Watercolor Crayons Journal Page. I had to go get a new Journal today. Just HAD to have one that would lay FLAT like Dyan's and Dina's. They only had the very thin papered Moleskin Journals at Barnes and Noble, and Hobby Lobby only had good paper in the ringed binders. So I got an Hard Cover ecosystem, 80lb. white paged Journal and it didn't take spritzing well....at least not for me on the first try. But, I didn't give up, I just tried it again with watercolor crayons, Distress Ink, and very little water on a brush. I'm happy with it....only after layers and layers do I ever think anything is what I like. When will I ever learn and just keep going???? I use the Caran d'Ache Watercolor Crayons and Distress Ink pads for background color. These are the Papillon Butterflies stamped with Jet Black Archival Ink and colored with the new Distress Markers from Tim. As you can see, they didn't stand out too well, so in the finished project I had outlined them with the fine tip of the marker and liked them better. This is the same stamp on a Manila Tag with the markers. The background on the book made them darker. So here they are on their own. Then I used the Markers on the Kraft Resist to show you how cool that looks! Lovin' the colors!!!! Practice, practice, practice....like I tell my dear friends in class!!!!! That's it for tonight......Emma won her game today....Erin tomorrow! First of all, let me tell you what I used to do for a living.....I started out as a Long Distance Operator YEARS ago. You've seen the old cord boards in pictures, where the operator has on a headset, and a bunch of cords in front of her with all kinds of lights and plug in spots??? Well, that was me, working nights and trying to stay awake....yawn...so I doodled to occupy my time. I was usually in trouble for it, but back then, you were in trouble for not sitting properly or chewing gum. Now you can pretty much do anything at work....I won't go there! So Doodling is right up my alley. And dear Kaz said it would be addicting, and she was right. I started with Watercolor Crayons. Then Julie Balzer stencils, ink, stamps, pens, paint....the sky is the limit!!!! And it was Sarah Greer that said it's "colouring for grownups". NOW, the fun news is I'll be teaching again at Prairie Art in Springfield, IL on Apr. 21st from 10:30am till 2pm. And this is the class. It has 4 mini canvas works of ART with embossed metal. They're on a canvas board that is easily slipped into a frame from Wal-Mart....seriously. 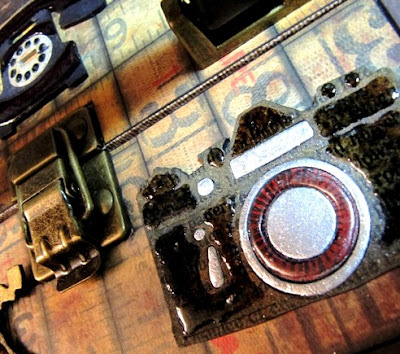 We'll explore Metal Embossing, Alcohol Inks, Tissue Tape, UTEE on Metal, and create an heirloom treasure in the end. So give them a call and come and have a fun time with us in April. Well, it's been quite awhile....a lot of water has gone under the bridge here. I was dazzled by Dyan Reavley's demos in Chicago, and the ones from Anaheim were no less amazing. It's been YEARS since I entered anything in this Journal, but there's no time like the present to play. So here are the layers and layers of fun you can have in Journaling. I am anxiously (NOT) awaiting the mail for my new Tim Holtz Distress Markers. They will be so much fun, and I know I'll be immersed in color. Just a note of bragging.....my daughter Michelle, grandson Alex and his dad at the Illinois State Speech Finals last weekend. Alex and his team partner Peter were in the final round competing in the Humorous Duet Acting class. They finished 6th in the State for a Grand Finale of the year. What a tremendous honor and an outstanding performance! So proud of all the kids that won at State from Moline. All of my tulips are up.....that's the good news I guess. The bad news is all the tulips have been eaten down to the ground by the rabbits that live under my neighbors deck!!! Hopefully they will still bloom as they've now been protected with little cages so the bunnies will have to forage elsewhere! These were my Valentine flowers from Bill....they may be all the Spring flowers I'll see. Have a great week.....we'll talk soon. This is the Trinket Case from Tim Holtz that I altered. This is how it finally ended up....but there were stages along the way to share. These are 3 of the new really cool Mini Dies from Tim Holtz. They're cut from Grungeboard, inked, stamped, and enhanced with Glossy Accents. I love 'em! I measured, cut, and Distress Inked my favorite collection of papers Lost and Found. I like adding Tea Dye and Vintage Photo for added contrast in colors. These are cut from the ATC sized papers....I hoarded them. But now I can see them on my desk. The Plaquettes have Butterscotch Alcohol Ink dabbed on them. Here is a closeup of the little Typewriter. I painted some of it with Silver Mixative and a brush. This paper is from the Kraft Resist collection. I used Tombow markers to color. Greys and blues were used to shadow that adds the depth. Cannot wait to see what Tim's new Distress Markers can do on Kraft paper. Then I used more Alcohol Ink and Mixatives to color the Pen Nibs. The Calendar Pages and Rulers are a fun addition to the inside. Ignore the scattered occupants of the drawers...I've become a "digger". Never thought that would happen. Something pretty phenomenal for a slightly OCD person like myself. My favorite is the little Camera and all the little pieces that pop out so you can ink and paint. Hope you find some inspiration here. You can Pre-Order these goodies at Inspiration Emporium! Get out the paper cutter, glue, and get started!!!! This is a short and sweet! It's so easy, it's almost sinful! I used Regal Flourished embossed Metal Foil Tape on a piece of Chipboard. You can use pieces, it doesn't matter, just make a pleasing pattern. It's had many colors of Alcohol Inks added in layers. Let it completely dry and sand off to reveal the silver again. 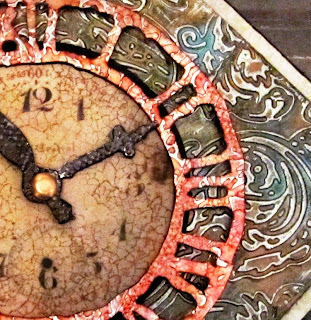 The Weathered Clock and Hands are made the same way only it's embossed AFTER it's die cut. I used a Texture Wheel from Ten Seconds Studio on the hands and Black Soot Alcohol Ink. I think they turned out looking pretty cool!! There's a tiny bit that doesn't get embossed, just run it through again just on the section that didn't fit. The Clockface center is from Tim's Lost and Found Paper Stash. 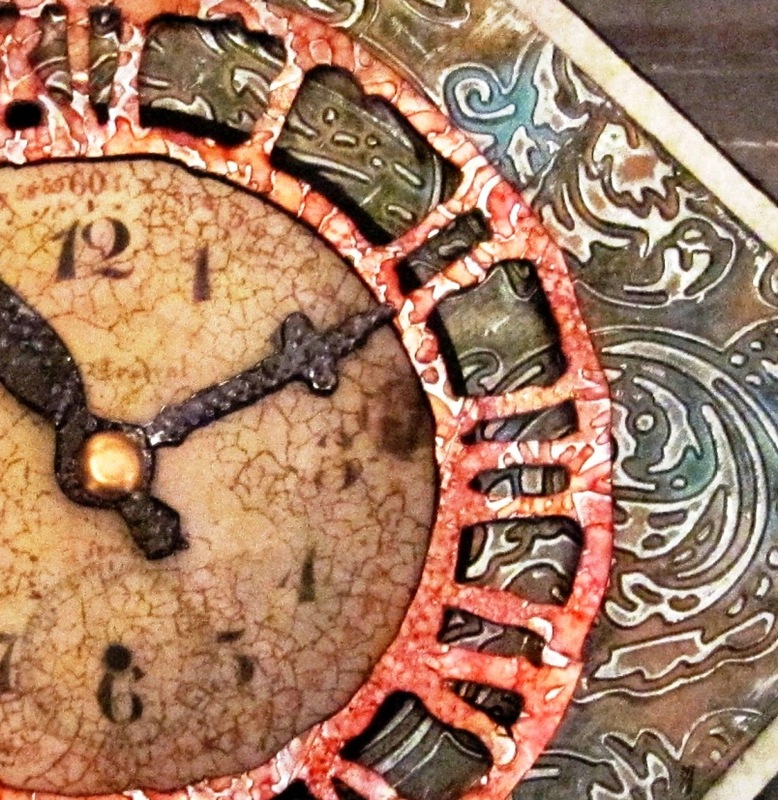 I added some Distress Inks and a crackle stamp over the clockface. To give it some depth, I layered it all with chipboard and added the piece of light colored paper at the back for contrast. It's a diamond shape, so it should add a different look to a wall hanging group. I'm planning a vacation get-away, and I can't wait to get out of Dodge! More Destinations goodies from Tim Holtz on this tag. New Idea-ology pieces as well. New Tissue Tape Commute that I LOVE, LOVE, LOVE! The Mini Rosettes are cut using the Destination Paper with the State Postcards. Salvage Stickers adorn the centers. Mini Gears are here, too! This is how is all starts. First I add the Tissue Tape. Then the Distress Inks...Pumice Stone, Dusty Concord, Stormy Sky, and a tiny bit of Pine Needles all over a #8 Manila Tag. Flicked with water for some fun. Stamp with Jet Black Archival ink using the Steampunk and Little Labels sets. I added a clear stamp from Tim along the side. I just keep going until I get the colors I like...LOVE how this turned out!!! I added a Wire Pin and Gears...new Mini and Sprocket...with a Chain Tassel to the top. MUST HAVE NEW MARKERS FROM TIM!!!!!! The little Memo Pin has numbers punched out and added with Glossy Accents over the top. A little watch part goes great in the center of the Sticker. I used a piece of left over Grungepaper and Metal Foil Tape from the Roofing project at the bottom. A Texture Wheel from Ten Seconds Studio adds design and Alcohol Inks give some color. The Coffee Archival Ink was used with the Artistic Outpost stamp around the corners. Then I layered the tag up on chipboard that has Fired Brick Stain and Black Soot Distress Ink on it. You can Pre-Order all these new products from Inspiration Emporium with $5 shipping in the US. Use “chaspecial” through Feb. 5th for 20% off your order!!!!! So what are you waiting for.....go check it out!! !